Dieses Thema im Forum "Music" wurde erstellt von Invictus_Productions, 09. Januar 2008. 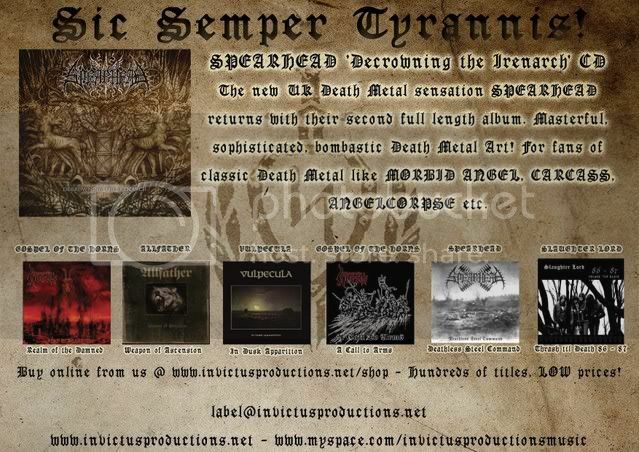 The new Spearhead album Decrowning the Irenarch is OUT NOW! Available from all major distributors (PlasticHead). See Invictus Productions for more information, where a worldwide distribution list can also be found. Masterful, sophisticated, bombastic Death Metal art, based on the philosophy and metaphysics of war. For fans of classic Death Metal like Morbid Angel, Carcass, Angelcorpse, Sadus, etc. Engineered by Wojciech Wieslawski (Vader, Decapitated, Hate, Azarath, Witchmaster etc.) during a 2 week period in June / July 2007. Artwork by Manuel Timmens (Urfaust, Pentacle, Bunkur etc.). Too bad there's such a shortage of original band names these days. I only imagine the (much older) band <a href="http://profile.myspace.com/index.cfm?fuseaction=user.viewprofile&friendid=19598580">Spearhead</a>, when I hear the name.